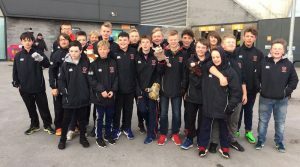 A memorable experience was had by all on the S1 trip to Manchester Sale Sharks tournament. On the Friday the S1’s attended the Sale v Gloucester game where they met Greig Laidlaw in person. On Saturday the Linlithgow boys should be proud of themselves as they finished the 15’s tournament as runners up. The trophy went to Bolton who drew 4-4 with Linlithgow in the final game, but Bolton had an overall higher tournament try count. On Sunday the boys split into two 7’s teams and although the S1’s found this harder going, they gained invaluable experience against opposition that was physically much bigger a good 10 months older. The Linlithgow lads created a good impression with the other teams taking part.